Little is known about the migration routes and depth use of salmon following their return to the Scottish coast from marine feeding grounds. The information is of great importance to help us to understand, for example, if there is potential for interaction with the developing marine renewable industry. Working alongside Armadale Salmon Fishing a study by Marine Scotland Science began in 2013 to investigate the movements and depth use of adult salmon. A total of 50 fish was tagged with pop-up satellite tags that recorded depth and water temperature at regular intervals during May/June 2013. 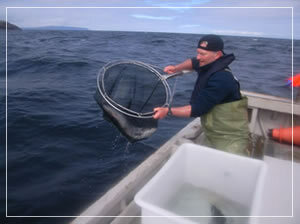 The tags were programmed to detach from fish at pre-determined times. Stored information could then be interrogated and recorded by passing satellites and finally downloaded to computer or downloaded directly if the tag was recovered. Information was obtained from 47 of the tags. This is currently being examined and will be reported on in due course. The study is set to continue in 2014 with fish being tagged in the late spring/early summer period. Anyone finding a tag should notify Marine Scotland Science, Freshwater Laboratory, Pitlochry PH16 5LB. (telephone: 01796 472060). 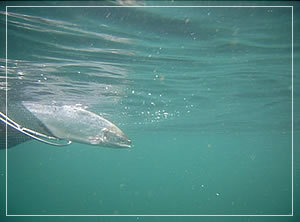 A reward together with information on the history of the tagged fish will be provided on receipt of the tag. 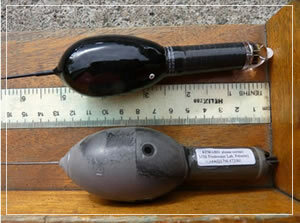 Examples of satellite tags fitted to salmon at Armadale in 2013. Tags (excluding antennae) were approximately 12 cm in length and designed to float on the surface after release.